Holi, the festival of colors is here and preparations can be seen in full swing. Zest, enthusiasm and fun fills the hearts of one and all on the joyous occasion of Holi as we all attempt to infuse our lives with color, purity and love. As the festival is here, I would like to share how you can celebrate Holi to the fullest! Whether with ‘bhang’. Water filled balloons and of course, color, you can look forward to Holi with a bang! Lots of legends and stories associated with Holi celebration makes the festival more vigorous and vibrant The most famous one is related to the killing of Holika. The story centers around an arrogant king who wanted everyone in his kingdom to worship him. But his son Prahlad refused and worshipped Lord Vishnu instead. He attempts to kill his son but fails each time. Finally, the king’s sister Holika who is said to be immune to burning, sits with the boy in a huge fire. However, the prince Prahlada emerges unscathed, while his aunt burns to death. Holi commemorates this event from mythology, and huge bonfires are burnt on the eve of Holi as its symbolic representation. The evening before the riot of colour takes over, the air is filled with the scent of charring wood as a bonfire is lit which is symbolical of the distruction of the demoness Holika by the God Vishnu. Prayers are recited, songs are sung and people dance around the bonfire as they celebrate the victory of good over evil. As there is an old saying “Prevention is better than Cure “ – I would like my readers to know some of the precautionary measures to be taken care of while playing and post holi. 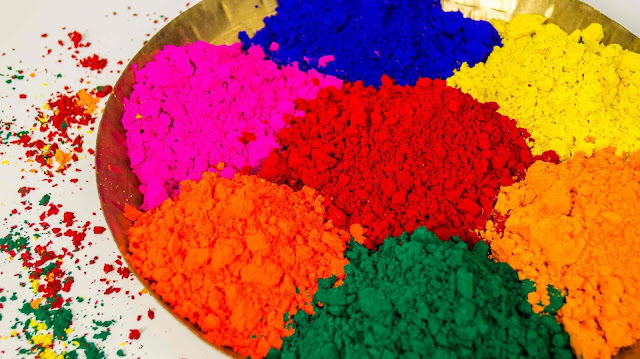 Since Holi is all about color, you should be prepared that there are some colors that do not come off – no matter what. So steer clear of your favorites and bring out some old white clothes, after all, you want the color to show don’t you? Organise some color -Holi colours may harm your skin and hair. Try and make natural colours from flowers like marigold and kitchen ingredients like sandalwood and turmeric, for you to be able to throw on your friends and family. Besides color, you can also organize flower petals and dyed water for this festival. It depends on how violently colorful, or not you want to be on that day. This is the day where you can satiate that sweet tooth and no one will even judge you for it. Let your cravings run wild as you enter a local sweet shop. Ensure to stock up on the sweets so you can spread not only color, but also sweetness amongst your friends and family. Forget your quarrels and differences and enjoy this festival. 1. Hair can turn brittle, frizzy and extremely dry due to Holi colours. Shield your hair from harmful chemicals, dirt and dust by massaging the scalp and hair with oil. Wear a cap or hat before heading out to play Holi. 3. Hair should be washed with natural products like shika kai powder, amla powder, or reetha and lemon juice can be added to prevent dryness and it also takes care of any infection. 4. If applying shampoo, Don't over shampoo and try to remove all the colour in a single day. if its not going, shampoo nicely the next day. 1 For your ears and lips, you can use Vaseline or lip-balm respectively to keep them moisturized . 3. Playing out in the sun can be dehydrating. Drink lots of water all through the day. It's high time we realize that Holi isn't for animals. When we throw colors on them, we should realize they can't wash themselves, and these colors can cause them serious issues. Your fun could cost the life of these poor souls. So please don't do that ever. Before picking up a friend and throwing them in the pool (of mud, maybe), make sure he/she is up for it: Given the number of bodily problems we're all living with, it's probably a safe idea to warn your friend (in jest) beforehand, if you intend on doing the noble deed, that is. Have a safe and Happy Holi 2018 !